When the craziness of everyday life takes a toll, you may not know how to respond to the stressors and sleeping might be what you need the most, but what you get the least. 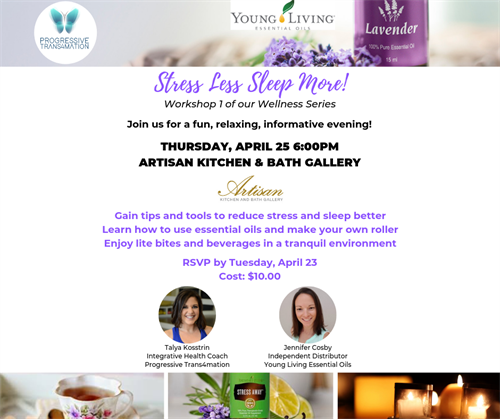 Join Wellness Educator, Jennifer Cosby and I to discover how to Stress Less Sleep More! on Thursday, April 25 at 6PM at Artisan Kitchen & Bath Gallery. 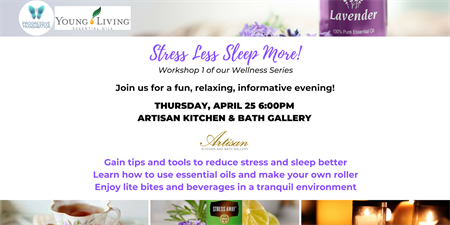 During this fun, educational, and interactive workshop you will gain tips and tools to reduce your stress and sleep better, make your own sleepy time roller using Young Living Essential Oils, enjoy light bites and beverages in tranquil atmosphere, and even play a little BINGO.